Her mom died of kidney cancer in February, before Rebecca got the chance to tell her she was pregnant. She's always known her mom was watching over her, and now she has proof. Sharon died of kidney cancer in February, before Rebecca Melia got the chance to tell her she was pregnant. 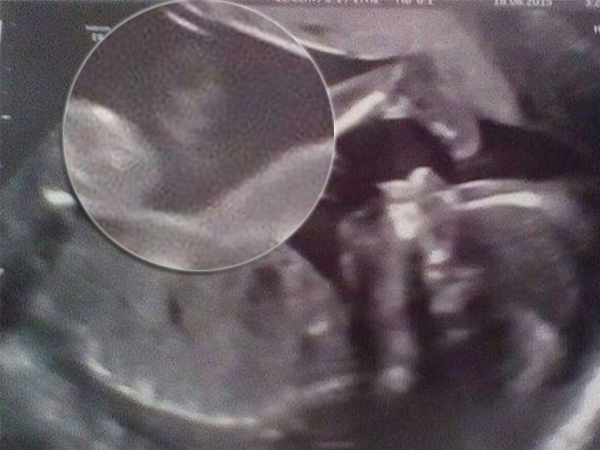 So the 30-year-old from Kirby in the UK has taken comfort of what looks like the ghostly image of her mom's face on her baby scan. Initially, she was scared when the nurses took so long to give her feedback when she went for the scan on June 18. She thought they had picked up a problem with her baby. "I was convinced it was something wrong with my boy. Not even thinking what was to come, the lady gave me the picture and she said 'I think you might like this one' with a smile on her face. And the nurse did know my mum had passed away." "I couldn't believe it; I was shocked, happy and overwhelmed all at the same time," she told the Liverpool Echo. "My mum's face, which I longed to see, was there as clear as day on my scan."